One of a pair, 2 colour lino print. 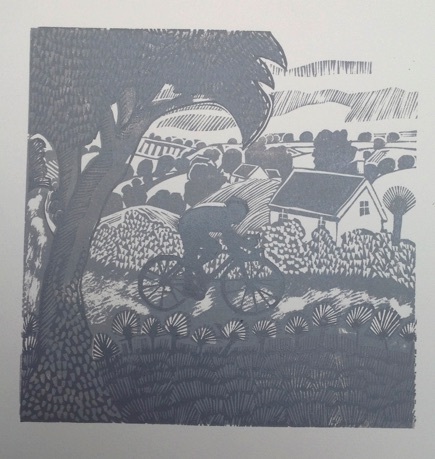 I was asked to create some new prints on a cycling theme, One of the gallleries that stock my work was on the route of 'La Tour de France' . Sunday is a day I associate with cyclists, in the village there is ample parking, quite often various cycling clubs arrive on masse in cars, park up, get changed and peddle off in whatever direction they have chosen for their ride. I heard one such participant one day using the phrase 'A sunday ride' but it didn't look like an ejoyable experience for them on their return.